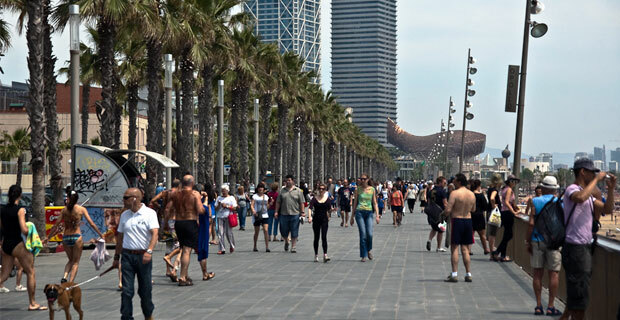 It’s an accepted rule that visitors should dress respectfully and appropriately when visiting any of the many churches or monuments across Spain, but visitors to the Catalan city of Barcelona should be aware that beachwear is confined to the actual beach and promenade areas, and tourists should cover up or face a significant fine. The clampdown comes as more and more visitors head to Barcelona for hen and stag parties, once the domain of the southern coastal resorts, which city authorities are trying to discourage. Under the new rules, those found walking the city streets in bikinis or trunks are liable for fines of up to 300 Euros, while those who dare to bare more can face fines of up to 500 Euros. After the Second World War, the whole Mediterranean area began to receive more and more holidaymakers, and Spain was no exception. The foreign currency that the burgeoning tourist industry brought with it was desperately needed, and many felt that more needed to be done to attract even further visitors to the many seaside towns and villages. One of these was a small fishing port called Benidorm, where the local Mayor, Pedro Zaragoza, was a trail blazer of the tourist industry. Not only did he encourage airlines and the hotel industry to work together to fill their seats and rooms (thus inventing the package holiday), but in order to entice even more visitors to his town rather than those of the more ‘relaxed’ European resorts, he passed a law allowing the banned bikini to be worn on Benidorm beach. Zaragoza faced a huge backlash, and was even threatened with excommunication from the church for his actions. But, as the story goes, he rode his motorbike for 9 hours all the way to Madrid for an audience with General Franco, who despite his strict conservatism, was convinced that the economic benefits outweighed any religious objection. The bikini continued to appear on Benidorm beach, quickly followed by many other seaside towns, and Spain’s tourist industry boomed! To explore the coastal resorts of the Costa Blanca, why not hire a car from AurigaCrown, where our car hire partners have offices in convenient locations such as Alicante airport, downtown Benidorm and Torrevieja. Alternatively, if you’re heading for a city break to Barcelona, we also have locations across the city, the airports and surrounding areas. Book today to guarantee the best rates!